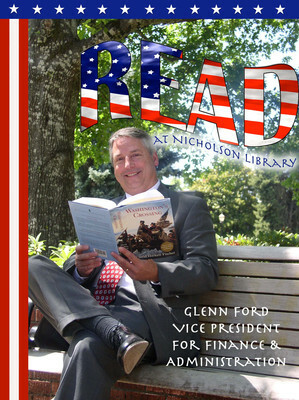 Glenn Ford, Vice President for Finance and Administration/Chief Financial Officer, reading Washington's Crossing, by David Hackett Fisher. Terry, Paula and Nicholson Library Staff, "Glenn Ford READ Poster" (2008). READ Poster Gallery. Image. Submission 30.